The Play That Goes Wrong returns to the Darlington venue in which we saw it the first time around in 2014. We hailed it as the 2014 Comedy of the Year and, sure enough, we were not alone as the production picked up Olivier Awards in 2015 and Tony Awards in 2017. We saw it again in Newcastle last year and it had lost none of its shine and it picked up our Best Comedy award, again, for 2017. As we return to ‘the scene of the crime’ we are celebrating a pretty unique show which has the audience laughing far more than the average panto. What is it about? Cornley Polytechnic Drama Society have turned up to produce a murder mystery The Murder At Haversham Manor. It is meant to be in the style of a classic Agatha Christie tale with the discovery of a body followed by the arrival of a detective whom we follow as they go through the clues before the final reveal. The only problem is the Cornley shows are normally run on a miniscule budget however, this time, they’ve tried for a bigger show. You also have the egos of the cast creeping in. A director who gives himself the leading role. Rival ladies who want to have their moment in the spotlight. Not to mention the rubbish actors who cannot learn their lines, or how to pronounce their lines, who make the numbers up. 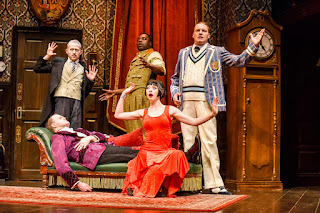 What make The Play That Goes Wrong go right so well is the timing. It isn’t just that a line is delivered wrong or a prop fails, it is the perfect timing of that action. Comedy works best when the delivery is well planned, even if appears to be ad hoc, and nothing is left to chance. There are also plenty of surprises along the way too. Forget Mischief Theatre’s couple of attempt at being funny on Christmas TV, it is on the stage when the real magic happens. The show begins before the published 7:30 start as Gabriel Paul and Catherine Dryden, as Trevor and Anne, are quickly trying to put the finishing touches to the set or running around the theatre asking arriving theatregoers if they’ve found the dog. The fourth wall is truly broken as they ask for support. As 7:30 arrives, the house lights go down and Jake Curran, as director Chris, introduces the play and gives a little bit of background to the company’s recent fortunes. The action hasn’t formally started but the show has already set its stall out and many in the audience will already be on their 6th laugh of the evening. 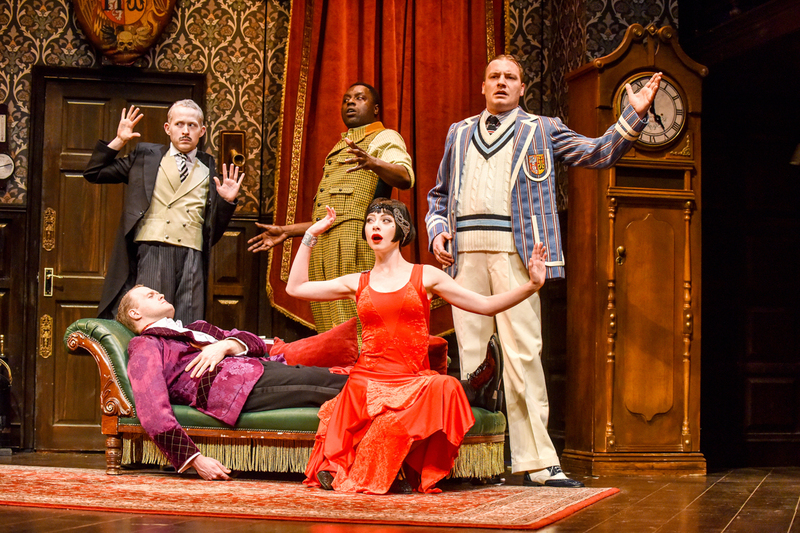 As the murder mystery evolves, the comedy becomes a strong ensemble piece. Director Mark Bell keeps the action punchy. No joke is over worked nor is any element of slapstick allowed to stop the flow of the narrative either. The list of creatives include a Health and Safety consultant (John Young), a pyrotechnics consultant (Jim Paterson), a Circus Skills trainer (Jami Quarrell) and fight directors (Greg Tannahill and Jonathan Waller) and that will give you much of the flavour of the show that runs just over 2 hours (including interval). I don’t want to have any spoilers here, as that would literally spoil it for you but, needless to say, if it can fall it will, if it can break it will and if it can go wrong – it will. The cast really engage with the audience well, it doesn’t feel like a passive experience for the viewer. This is not a show that does it to you, your laughter adds to the evening. No surprise then that the show has so sold well on it’s return to Darlington. Clearly word of mouth has spread about one of the funniest shows you’ll see. Yes, we would go and see it again! …and if you see Trevor’s Duran Duran CD, he’d like it back. 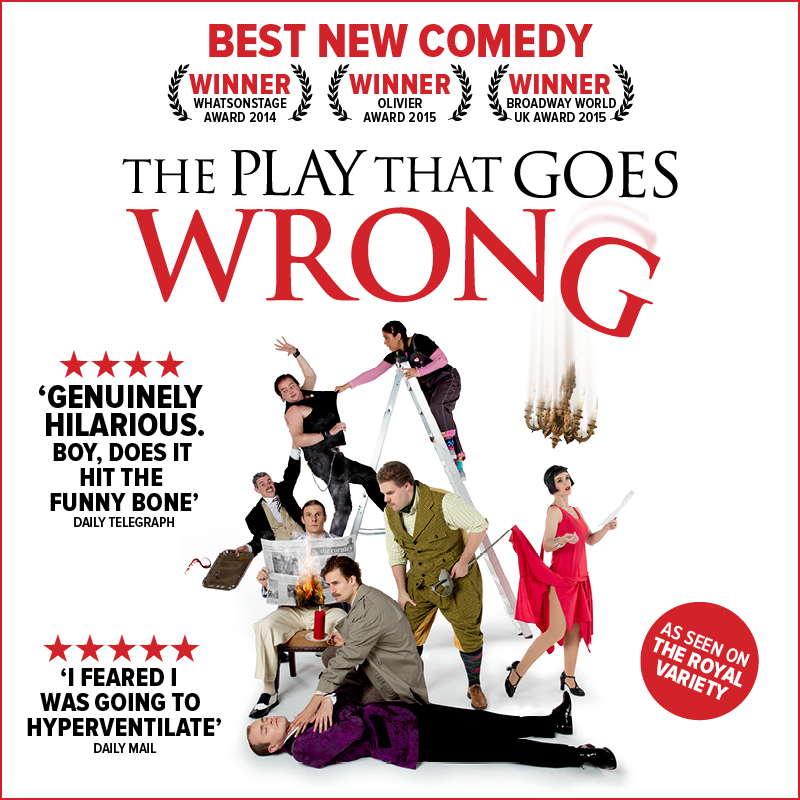 The show is on tour – see www.theplaythatgoeswrong.com and will revisit our region with dates at the Newcastle Theatre Royal (2-7 July) and Billingham Forum (17-22 September).